Synthesising the Aeolian harp is part of a project into synthesising sounds that fall into a class called aeroacoustics. The synthesis model operates in real-time and is based on the physics that generate the sounds in nature. 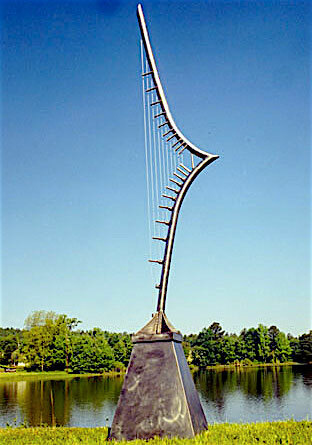 The Aeolian harp is an instrument that is played by the wind. It is believed to date back to ancient Greece; legend states that King David hung a harp in the tree to hear it being played by the wind. They became popular in Europe in the romantic period and Aeolian harps can be designed as garden ornaments, part of sculptures or large scale sound installations. Give me to the atmosphere. The harp in the picture is taken from Professor Henry Gurr’s website. This has an excellent review of the principles behind design and operation of Aeolian harps. As air flows past a cylinder vortices are shed at a frequency that is proportional to the cylinder diameter and speed of the air. This has been discussed in the previous blog entry on Aeolian tones. We now think of the cylinders as a string, like that of a harp, guitar, violin, etc. When a string of one of these instruments is plucked it vibrates at it’s natural frequency. The natural frequency is proportional to the tension, length and mass of the string. Instead of a pluck or a bow exciting a string, in an Aeolian harp it is the vortex shedding that stimulates the strings. When the frequency of the vortex shedding is in the region of the natural vibration frequency of the string, or one of it’s harmonics, a phenomenon known as lock-in occurs. While in lock-in the string starts to vibrate at the relevant harmonic frequency. For a range of airspeed the string vibration is the dominant factor that dictates the frequency of the vortex shedding; changing the air speed does not change the frequency of vortex shedding, hence the process is locked-in. While in lock-in a FM type acoustic output is generated giving the harp its unique sound, described by the poet Samuel Coleridge as a “soft floating witchery of sound”. As with the Aeolian tone model we calculate the frequency of vortex shedding for a given string dimensions and airspeed. We also calculate the fundamental natural vibrational frequency and harmonics of a string given its properties. There is a specific area of airspeed that leads to string vibration and vortex shedding locking in. This is calculated and the specific frequencies for the FM acoustic signal generated. There is a hysteresis effect on the vibration amplitude based on the increase and decrease of the airspeed which is also implemented. A used interface is provided that allows a user to select up to 13 strings, adjusting their length, diameter, tension, mass and the amount of damping (which reduces the vibration effects as the harmonic number increases). 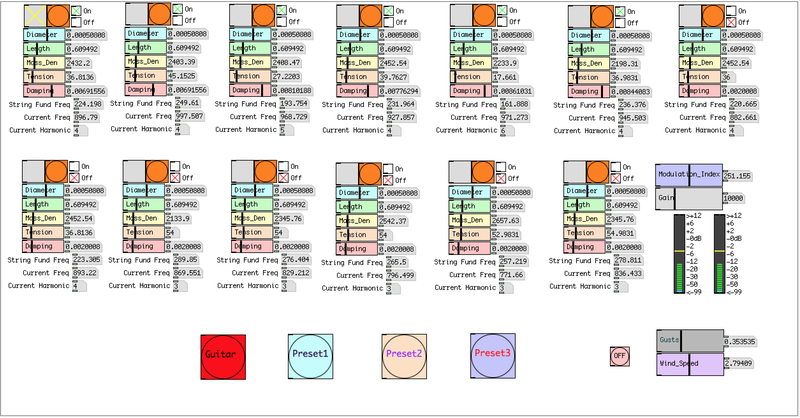 This interface is shown below which includes presets of an number of different string and wind configurations. A copy of the pure data patch can be downloaded here. The video below was made to give an overview of the principles, sounds generated and variety of Aeolian harp constructions. Would it be possible to use synthesized aeolian harp as an instrument in digital music composition, in a way that rationally maps its harmonics to notes? The use case I have in mind is to approximate Ligeti’s “Lux Aeterna” with aeolian harp. I imagine either real or synthesized aeolian harp samples would be a starting point. Hi, thanks for your question. I certainly think something could be done to map to notes. One method would be to set the wind speed to something like 2 m/s and tune the strings so that the desired harmonics are at a frequency you are looking for. If I was to sit down and think about this more it probably involves working back from the fundamental equations with set wind speed, required frequency and calculate the diameter. After that adjust the length and tension to match the harmonic frequency. You can look along those lines anyway. If interested but don’t like the equations email me at rodselfridge@hotmail.co.uk and I’ll see if I can assist further. An easier option might be just mapping the harmonic number to a pitch and using the lock-in on/off as a trigger for the note….